Three months ago, I bought a Microsoft Surface Pro 4 from Amazon, a brand new Surface Pro 4. After buying this Surface Pro 4, my job have been being effected a lot, and I think Microsoft should stop selling this kind of terrible laptop/tablet, recall all Surface Pro 4 they had sold, and they should test their products more carefully before sell it. My first Surface Pro 4 got dead touchscreen issue after a few week. The touch function didnt work totally after that, and I had to use it as a laptop. I tried many ways to resolved the problem, but it did not work, even reset to the factory mode. The battery of the device then stopped working too (plug-in, not charging), and it immediately turns off when I unplug the charge cable. I had contacted Microsoft Support Team in the USA, they asked me to return my SP4, then they would sent me a replacement. I had to spend 120USD for two-way shipping (Vietnam - USA), because they sent me a free shipping FeDex label use for US domestic only, and I'm living in Vietnam. I have just received the new Surface Pro 4 yesterday. But I'm very dissappointed, this second SP4 is a another faulty device, it has "phantom" touch problem. This happened right after I started the device for the first time, it's automatically touch the screen by itself every few minutes, at the same place (about 4cm on the right of the screen center). I have to disable touch drivers if I want to use this device. Yesterday, I contacted to Microsoft Support Team again, they tried to remote control my device, used some tool to fix it, but it's not work. They asked me to reset the device. I did, but the issue still occurs. I can't understand that why they did not check the quality of this replacement before sending. I'm sorry to say that Microsoft is trying to defraud me. They have no any solution for my case, so they asked me to contact Microsoft Support Team in Singapore for a replacement again. This morning, I contacted Microsoft Support Team in Singapore. Singapore Team told me that they could not send me a replacement because I'm living in Vietnam. They asked me to give them an address in Singapore that they can send a new replacement, or I have to fly to Singapore. Oh my God!!! Of course I denied, I dont want to spend any cent for this nightmare device!!! That's enough. Singapore Team gave me another solution, that I must send my device to US again, then they will refund, but they told me they were not sure how much I would receive. After talking with Singapore Team, I contact to US Team again (just 1 hour ago), but USA Team denied to process any refunds (even Singapore Team promised), the only solution they offer that is I have to return this nightmare device to US again!!!!!!!!!!!!!!!! Be aware if you are thinking about buying a Microsoft Surface. Take my experience as a costly lession. This is not typical for Microsoft. It can happen with all makers. It's typical for not buying in a trusted local shop where they handle the warranty for you. A brick-and-mortar shop is even better for that than an online shop. What does Amazon say about the warranty? The problem is not about the shop, because I contacted directly to Microsoft Support Center, they sent me a replacement, but the second device is an another faulty device, this is the quality and service problem. All the units I've seen are good. I worry that you need to think about a good old business laptop so you don't get hit like this. That is, I do work for our office and we keep laptop spares in case an employee's laptop goes down. Some businesses don't understand that products like cars, trains, and planes are also unreliable. That is, you plan for the worst and hope for the best. Relying on a specific leading edge model is where I think a business could get burned. I believed in Microsoft, coz I didn't think that this company could produce a device like this. That's my fault. Just look at Microsoft Phones. Microsoft knows the Surface Pro is a dud, at least it's micro-memory model (4 & 8 Gigs) is. This became all too apparent to me when my husband purchased one for me as a Christmas gift. I'm a professional, in my 50s and going back to school. I thought my husband was a mind reader - what a wonderful gift! The excitement quickly turned to disappointment a scant 2 weeks later when I started to use it and it continuously crashed. It needed an update and though I was downloading it, it just couldn't execute. (Bloated software much?) How bad could that be, right? Microsoft: "Well, we've taken control of the computer and have tried everything we can. We will send a pre-paid shipping label to your Microsoft account and will exchange it for another one." Me: A NEW one - like the one my husband bought for over $1000.00 just 40 days ago?" Microsoft: "It's not new, but it's not used." Microsoft: "It's a replacement unit"
Ummm...***? This is a yes or no question folks! They never answered and I had a brick worth $1000.00 (purportedly). So they sent me a replacement and it was a refurb and yup, you guessed it! The "new" unit doesn't work! It's on, it's just that the whole screen is black. Which definitely gets in the way, although that irritating 'Update' reminder isn't anywhere to be seen now. Nothing can be. Literally. This after less than 5 hours of use. (Man, they're getting quicker at this self destruct stuff!) I called tech support again and asked for a NEW unit. They said no. No one gets a new unit. I said, even the people who just bought one? Have you no ethics or morales? The same thing happened to me. I raised a repair order, via a Microsoft Support walk-in center, for an out-of-warranty SP3 which had a cracked screen. They gave a FedEx tracking number, the status of which never changed from "Label Created" to anything else. It showed that the shipment of my replacement device had not been initiated. 20 days later (and several emails and phone calls later), they tell me that they had given me the wrong tracking number and the replacement device has been shipped to my walk-in center 10 days earlier itself. Now, I got all excited and collected the replacement device only to find myself back at square one. You guessed it, the replacement device was faulty as well. 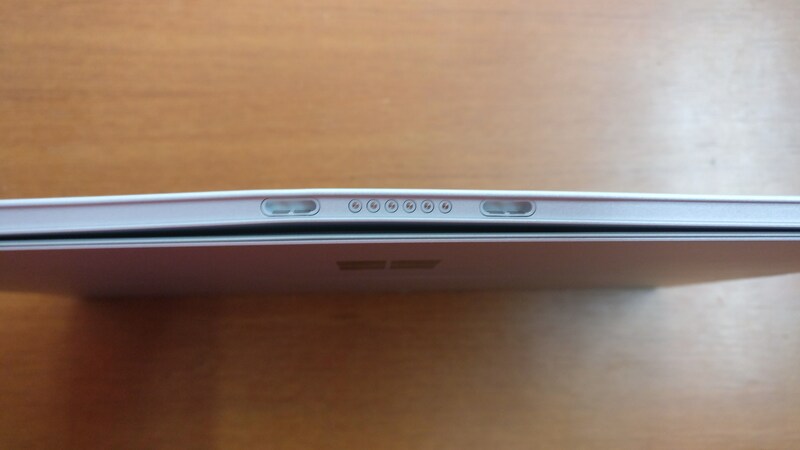 It had an overly curved bottom, near the connector which connects the Type Cover (physical keyboard). Because of that, I am unable to use my Type Cover. The connecting pins don't meet because of the bend and the keyboard is not detected. In reply to: Don't Buy a Lie. I have been going through the same issue since October 2018. I have now just sent my 4th Surface Pro4 back for an exchange. I have the I7 - 8GB Ram version. I use mine very light for work, emails, Microsoft office etc. It is always handled with care, I baby all of my electronic devices. 3. Surface 3 - Replacement came with dents and kept freezing even after resets, then finally the SSD died last week. I also have a Surface Pro 4..seriously used maybe 10 times....it is now 2 years old. Screen went black all the sudden to get fixed 499.00 and they replace with used. I decided NOT to bother sending it back rather purchase a different brand of laptop. In reading all these post and blogs very upsetting..maybe my fault for wanting the new hottest laptop seeing commercial after commercial. i have both an i5 windows 8 and i7 windows 10 pro 4. both went dark i believe to be heat related. i couldn't get them to reset. same thing on 3 different accasions. i was able to carefully wrap them in a towel and place in the freezer approximately 5 minute's both responded back to normal. i just quessed at this solution since i left an usb tv tuner plugged in an noticed it getting warm in that area. i hope this can help someone out startled situation. Quiet frankly the surface pro 4 is a really awesome system, though there are a few issues with its motherboard and design. just needs beefier diodes... otherwise it is pretty solid.. If you have your surface pro at a no power stage or has any other issues. Contact "Tech Device Repair" they do this but it is not cheap! A few people have successfully sent in their no power SP4 and were able to get it back working. "I had to spend 120USD for two-way shipping (Vietnam - USA), because they sent me a free shipping FeDex label use for US domestic only, and I'm living in Vietnam." I've used China's EMS system to ship items from China to USA, and it's always been a reasonable rate. Is that available to you in Viet Nam? Can you contact the support team in Taiwan instead? Also a Microsoft office in Viet Nam. Surface Pro 5 is no better. I bought one at the Microsoft store in NY. Came back to Singapore. It simply doesn’t respond. Terrible terrible software. The device looks glitzy, but that’s about it. Should have gone with my gut and bought a MAC! Apple doesn't mean you are free from issues. As to your model you should try a new post so we can get into possible fixes. My laptop fell off my bed, and the stand got a huge dent going outward ( how is that possible... ) basically, then like, 4 months later, the hinge breaks, the hinge is cheap, and my device sometimes has problems turning on, it's nightmarish. It on, but it's screen is just black, and on google the touchscreen is just bad. you can barely touch anything. I highly recommend not buying a surface again, if I had a better guess, buy from microsoft again, their a good company, just highly overpriced, and a bit inconvenient. I'd recommend going for the Surface 2, it's a less experimental device, unlike the surface pro 4, the surface pro 4 is more of a experiment in my words, it's basically a tablet and a laptop. The surface laptop 2 is much better I would guess, as again it is less experimental. This is bad far the worst investment I made in my entire life although I'm a college student in my mid 20s, but if there's anything I regret more is this piece of crap I'm carrying to school, I cant believe how bad the quality of this laptop is, never dropped it before and the screen flickering was so bad that I had to shut down the interface from the device manager. Do not buy this please. A used $200 or less laptop have a greater value than this. The updates are so bad that every day I have to update it.